The ambitious plans produced by the Lagos state government to redevelop the most populous city in Africa are often lauded in Nigeria. Moving around in this buzzing yet often dysfunctional commercial capital is often tortuous, with thick traffic and poor connectivity problems across the city. The current state governor, Akinwunmi Ambode, wants to remake the city’s image, turning it from a sprawling bottleneck of a city to a better structured and more functional one. But his plans to improve infrastructure and redevelop large parts of the city have had sinister consequences for swathes of the city’s population: the urban poor, who seem to have no place in Ambode’s vision. The last few years have seen an alarming trend of state-backed destruction of small businesses, markets and especially informal housing settlements, “regenerating” areas with new expensive housing and development. Last year a large fishing community in Lagos informally called the ‘waterfronts’, housed over 300,000 people. But in the last five months, three rounds of demolitions have ruthlessly left more than 35,000 people homeless. In November, the homes of over 30,000 people were destroyed by bulldozers. Last week a further 4,700 people were the victims of sudden midnight demolitions. According to residents, the destruction was supervised by state officials and police. A High Court ruling the previous January had said that previous demolitions by the state were “inhumane” and against the residents’ human rights, mandating all parties to enter mediation. All the same, residents were woken up by the sound of bulldozers which destroyed their homes, with no notice to collect their belongings. 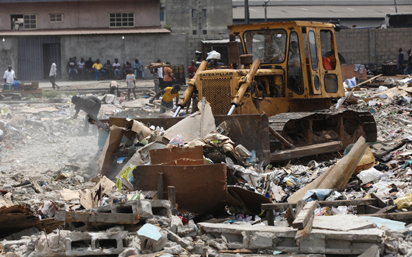 Demolitions like this have become increasingly commonplace in Lagos, where land is scarce and valuable. By some estimates, over two thirds of people in Lagos live in informal housing settlements. And not only is there a premium on expensive housing projects; many of the state’s big infrastructure plans, like the desperately needed bridge connecting the Island to the mainland, cut through areas filled with such settlements. After demolitions, many residents simply move to the outskirts of their destroyed communities or to other informal settlements. The cost of setting up shelters to live in is far more is feasible than formal housing costs. Too often the government prefers to evict and demolish rather than mediate. It rarely provides assistance for tenants to move, or regulates and redevlops those areas with them in mind. After a kidnapping near the waterfronts, the governor of Lagos, Akinwunmi Ambode, described the communities as “the abode of miscreants/street-urchins, kidnappers, touts, street traders and hawkers”. In his vision of a modern Lagos, slums and street sellers have little place. Government policies have also made it increasingly hard for the urban poor to work. In many settlement areas, small markets spring up to cater to the communities that live there. Small businesses also set up in other areas that aren’t approved, or in complexes rented from landlords who aren’t transparent with tenants about ownership disputes. On side streets, women sell items laid on fabric or stools. And on the streets of Lagos, young men and women, and sometimes children, weave dangerously between impatient motorists: the gridlocks that hurt the city present a ready market for those selling anything from drinks and snacks, to underwear or household furniture. Officially a ban on street trading has been in place in Lagos since 2003, but in the last year, in certain key areas, it has been more keenly enforced. Millions of families rely on street trading for income, yet its dangers and problems are clear. Here too, instead of reforming a system that millions of people rely on, the government wants to end it entirely. State officials have in the last year targeted key areas, arresting street sellers and confiscating their goods. The government claimed that, after the ban, street traders would be able to access loans to start more formal businesses. But poor capacity, access and loan requirements have made it a out-of-reach for many traders. Gentrification is a hallmark of major cities all over the world. But in Lagos, to many of the city’s poor, it’s manner is particularly violent and cruel. The governor is keen to be the face of a new Lagos, attracting and administering new redevelopment projects. But he is not prepared to work out how to rehouse or compensate the people whose lives are being torn apart by such plans. He wants Lagos to be more ordered, for selling on the street to move into more regulated areas. But as the space for those areas diminishes to make way for shopping malls, and the costs outstrip people’s resources, there are many reasons why people aren’t selling there in the first place. Regenerating and reforming Lagos is not a problem in itself. But the disregard for many of the people who live there is fuelling needless suffering.